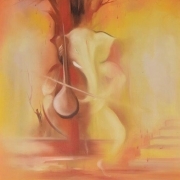 Painting Oil on Canvas | 72" x 36"
Painting Acrylic and Oil on Canvas | 36" x 72"
Painting Oil on 100% Acid Free Reg Paper | 27" x 37"
My fascination with Hindu deity, lord Ganesha, is significantly visible in my paintings. More usually than not, I draw lord Ganesha using varied techniques and drawing styles with a blend of my modern personal aesthetics. Representing Ganesha in different avatars bring rapture and delight to my soul. Other subject that intrigues me is horse anatomy. I genuinely feel horses are one of the most beautiful creations of god and so, I have produced a collection of my art work which is a series that depicts horse anatomy in vivid forms through my personal outlook. Durshit is a 37 year old artist based in Udaipur. He holds a Masters in Fine Arts (Drawing and Painting) degree from M.L.S University, Udaipur. He has a strange fascination for Hindu deities and horse anatomy. Impressionist artist Edouard Manet has a deep impact on Bhaskar and so, he uses the same kind of small strokes in his paintings as used by the great impressionist painter. One of his most famous shows was held at Taj Mansingh, which bought him numerous accolades and admirers. Bhaskar has also acquired great knowledge in the field of auctioning because of his substantial interest in the same field.